Universitas Gadjah Mada (UGM) students never stop making innovation and creation. Now, Astri Ekaputri, Nabiilah Yumna Fauziyyah, Ammar Bimantara Muhammad, Eko Ridho Dinarto, and Faesal Faturrahman have processed sugar cane waste that is usually not used by the sugar factory into egg trays. "The quantity of sugar cane that is produced by sugar factories is huge. But this only turned into waste that is burnt down to remove it, which also causes pollution to the environment,” said Astri recently. These five students were inspired to process the sugar cane waste into usable product, which is egg tray. 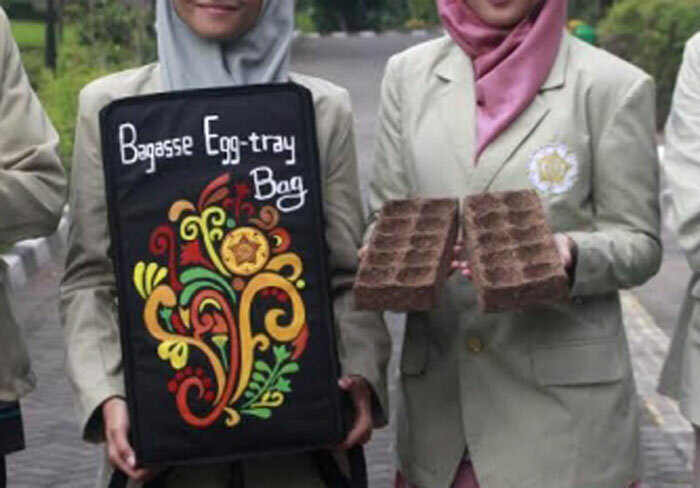 The egg tray is designed into a reusable, practical backpack. "We have designed the product as interesting as possible; it is also light and practical for user’s convenience,” she added. They hoped this product would help minimise pollution levels due to waste burning as well as become an alternative to storing eggs. Still more five students have used palm oil factory waste or empty fruit bunches into renewable biomass energy as alternative energy for society. The students are Sahal Sabilil Muttaqin, Saefullah Thaher, Cahaya Prautama, Sigit Arif Anggoro, and Namira Nur Arfa. Sahal said palm oil factory waste has reached as much as 6 million tonnes. Actually, the waste contains fibres that have compositions including cellulose (45.95%), hemicelullose (16.49%) and lignin (22.84%). These are potential to be developed into alternative renewable energy. The biomass potential from palm oil waste in Indonesia reaches as high as 22.75 million tonnes per year with water level 50% or 9.1 millions tonnes in dried form. “We process the palm oil waste into granule or preparate in the form of small sized powder particles,” he said. Cahaya added research on biomass from such waste had been done often before, but most had produced pellete biomass. Their research produced granules instead that can save some room as it takes the form of uniform aggregates and efficient shapes. Granular palm oil waste has the potential for combustion that is almost equal to that of coal energy in power plant. It can also be used for home industry as renewable energy that is environmentally friendly.